Isn’t she the cutest!? and there’s a quilt too. Be prepared because my grand niece might be the cutest baby ever! I know, I know. Everyone says that, but she’s really, really cute. And seems to sleep a lot. 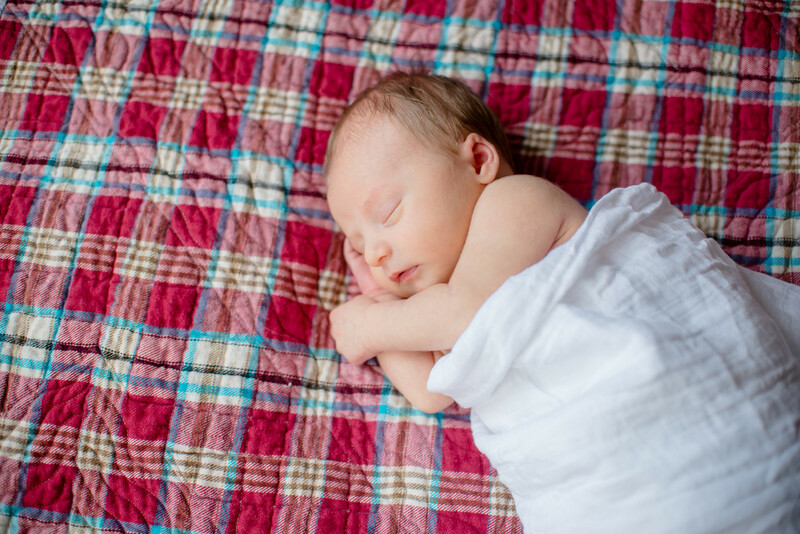 My niece sent these lovely photos of Collette sleeping on the baby quilt I made for her. So here are the photos. I want to keep gushing! But I’m forcing myself to stop. 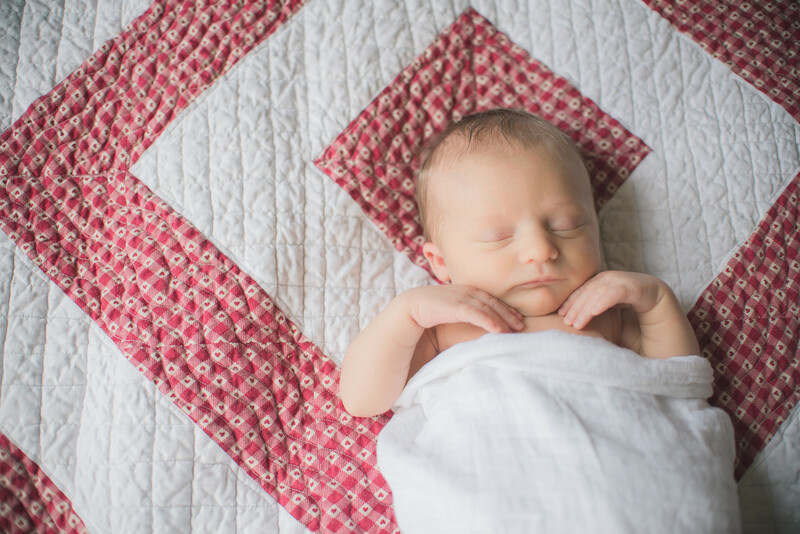 Here’s a bit about the baby quilt. The front used some sweet old-fashioned fabric found in my Mom’s stash (red-checks with little hearts) and Kona white. Half-square triangles, asymmetry, blah, blah…. 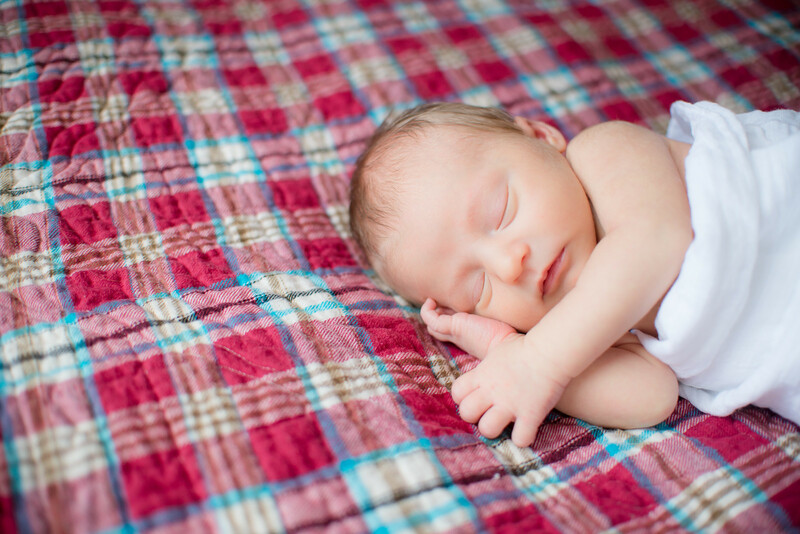 The back is a shirting flannel which I love to use for baby quilts. It’s soft, and they love it. The binding is flannel backed satin. Also soft and babies love it. The flannel backing on the satin makes it easier to sew with, and that’s why I search for it. For some odd reason, I had a hard time finding it. And I still haven’t found it in the quality of olden days. This was the 2nd baby quilt I’ve machine quilted, and while I made numerous mistakes, I begin to see a glimmer of light. And I’ve learned all kinds of things – like what to do if you free motion quilt a big fold in the backing. Funny story: I was really looking forward to a peaceful airplane ride where I could listen to my book on tape and sew down the binding on Collette’s quilt. Everything packed up – thimble, needles, finger condom [ah, I mean finger ‘cot’], small scizzors, and the quilt. Do you see the problem? I opened up my little sewing kit and – no thread. Very disappointing. 😦 I ended up sewing the binding down at my parent’s home, running it through the washing machine at the last minute, and delivering it wet. But she still liked it after it was dry. Last photo of Collette. She’s about six lbs in these photos. She’s 2 weeks old and she was 3 weeks early, so she’s tiny but strong! Did I mention how cute she is? Many many thanks for your informative writing. Back pain is very common matter for human. If you want to know more things about Quilts & Coverlets . I think that is very informative details for you. Yes indeedy, she’s cute! So much fun just to watch them, even if they are sleeping. Too precious! 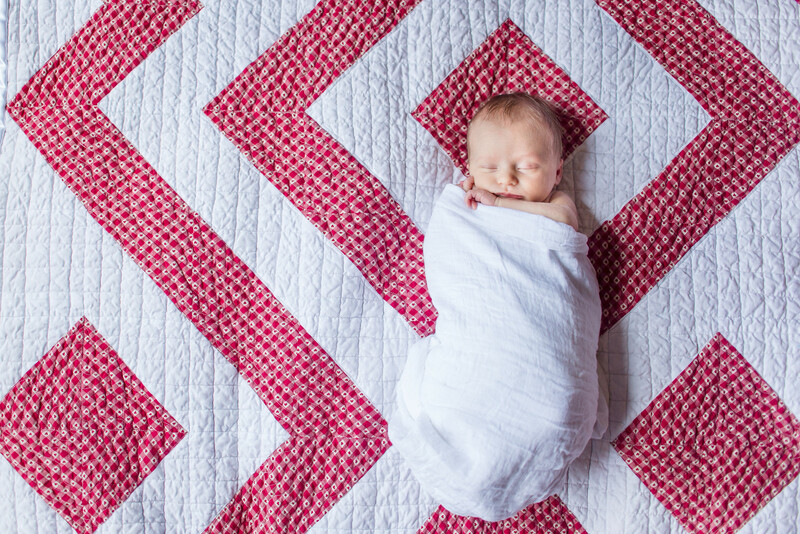 My daughter is expecting… I’m beginning to think “baby” quilts!! Congratulations! You’re going to have so much fun!